I'd like to introduce to you this sweet blogger, who's name is Inga (Intrigue blog). She lives in London and studies fashion and photography. Inga fluently speaks English and Russian as well. She has Armenian, Estonian and Belorussian blood in her veins. Love her unique style of dressing, that's why I want to share with you best looks taken from her blogspot profile. A totally white pantsuit is a perfect choice for this year! If you ain't having 90-60-90 body shape, then you shouldn't worry about that. Why? 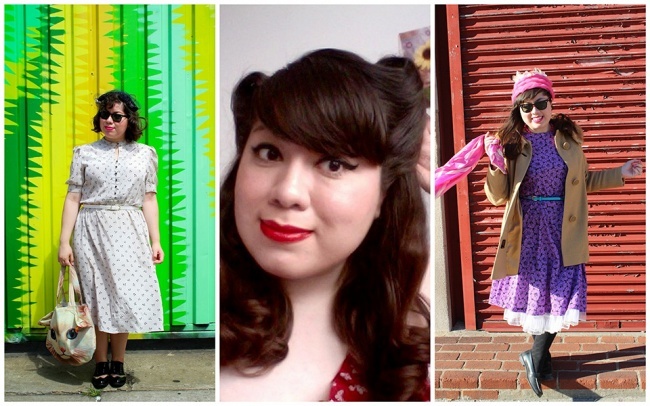 Take a look at these plus size bloggers and have yourself a great inspiration from their street style looks. All these pretty curvy girls and ladies urge everyone to love their bodies and be in trend. This decade comes with skinny celebrities and it's unfashionable to have an overweight. But the following ladies in the images below feel their selves self-confident with all those extra pounds. They have their own blogs where they show their new clothes. Some will say- curvy women should loose some weight before showing off their fat bellies, though I would say it's better to start loving ourselves as we are. These XXL sized fashion bloggers follow all the latest trends and they are not shy of their bodies. I love them! Twee Valley High blogger from Brooklyn has a real nostalgia about those retro times. She adores wearing creative hats, silk scarves, retro prints. She chooses ideal make-ups and hairstyles. We see cat eyes, braids and ideal red lips.